An administrator password is the password that you use to access the web-based setup page of your device and configure its settings. Changing the administrator password would add security to your network. By doing this, you can be assured that nobody else can access the web-based setup page and check or change any of the settings. Using a computer that is connected to the PLW400, access the PLW400’s web-based setup page. To learn how, click here. 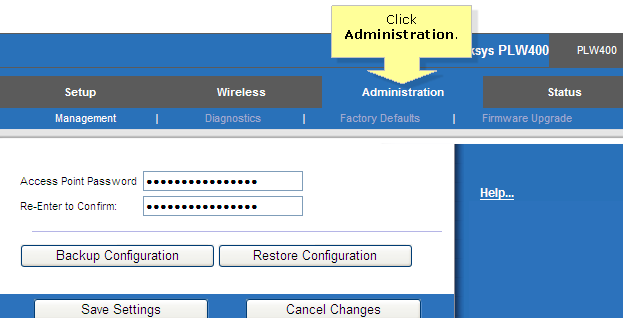 Once the setup page opens, click Administration > Management. Under the Management sub-tab, enter the new password that you want to use for the device on the Access Point Password and Re-Enter to confirm fields. Use the new password each time you log in to the PLW400’s web-based setup page.